Sen. Joe Donnelly (D-Ind.) speaks at the Hart Senate Building on June 14, 2017 in Washington, D.C. The big race on the November ballot in Indiana is for the U.S. Senate, where Republican Mike Braun, a former state representative, is running to unseat Democratic Sen. Joe Donnelly. 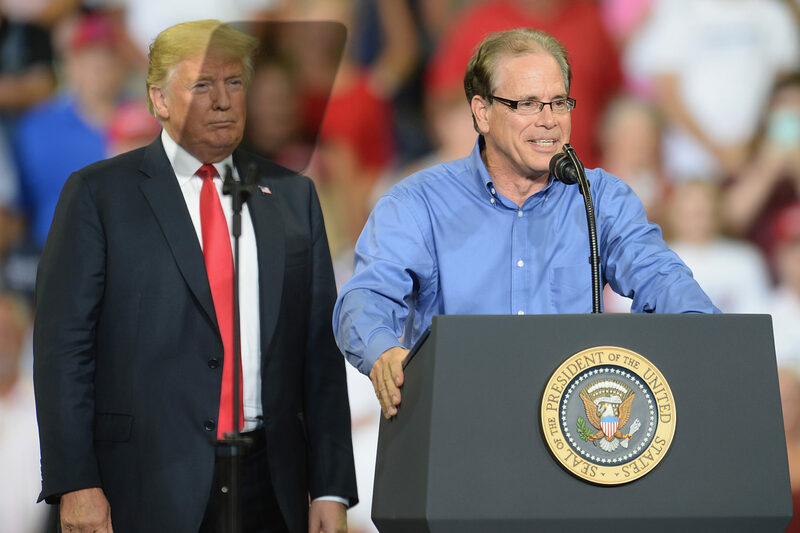 President Trump carried Indiana in 2016, and he visited Indiana last month to campaign for Braun. Both candidates are competing for the support of Trump voters, and in his campaign, Donnelly, who has served in the Senate since 2012, is highlighting his past cooperation with the president. Donnelly (@SenDonnelly) tells Here & Now’s Jeremy Hobson that he will “work with any president,” but his primary responsibility is to the people of Indiana. “It’s a very, very problematic situation. It is causing incredible heartache and incredible challenges in my state of Indiana. I have said for a long time that we needed to fix the situation in our steel industry because my state is the No. 1 steel producing state in the country, where China dumps steel in the country at below cost. And so that is a situation that is its own stovepipe that can be fixed that we’ve been working on. I’ve testified before the International Trade Court on numerous occasions on behalf of our steel companies and that issue can be fixed. We did not have to go into an overall trade war in order to do that. And the people who are struggling and suffering from this now are farmers who are seeing their soybean crops, corn crops, pork production crops, at below cost. And it makes it very very difficult to try to keep your head above water financially for our [agricultural] community. Additionally for our manufacturers — barbecue grill manufacturers, lawn sweeper companies, companies that have a lot of metal product in their line — it’s very very difficult for them right now in terms of the increased costs. And so we need to find an off ramp for this, and we need to get it settled. “One thing we did was a Comprehensive Addiction and Recovery Act that my efforts helped lead to changing prescribing practices so that the number of opioids that are out there are reduced. The 21st Century Cures Act also produced extra funds to the state to be used for the battle against opioids. We are working right now, [Republican Sen.] Lisa Murkowski and I, on what’s called the Strengthening Addiction Treatment Workers Act so that if we can get more people into communities to be able to provide psychiatry assistance, psychology assistance, the assistance in drug addiction treatment, that for all of those folks who are helping with that effort in our rural communities and elsewhere that they will receive a reduction in their student loans that they might have. It can be up to $250,000 over six years in terms of loan reduction.